There was quite a gloom around us when we left for the tomb of Itimad-ud-Daulah from our engaging morning at the historic Mehtab Bagh. We once again obliged ourselves with the woolens to remain comfortable in the growing chill. Our cab stopped near the allotted parking space on the main road itself. Taking our belongings we moved towards the ticket counter located in the left office block to book our entrance. Located on the north-eastern banks of the Yamuna, after the majestic Taj Mahal, Agra has its one of the most prized possessions, the “Jewel Box” mausoleum of Itimad-ud-Daulah. This marvellous monument was built from the year 1622 to 1628 during emperor Jahangir’s reign by his wife, empress Noor Jahan. The tomb is the resting place of Mirza Ghiyas Beg who received the title of “Itimad-ud-Daulah” from the Mughal court. He was a Mughal noble and father of the empress Noor Jahan. The tomb received its “Jewel Box” name from its peculiar jewel box like shape and Pietra Dura works on its walls which was the first of its kind in the Mughal empire before emperor Shah Jahan had pioneered the art later during his reign. Historical findings indicate that emperor Akbar had planned and started building his own Makbara or mausoleum (Tartary custom). But due to the unrest created by his rebel son Salim (Jahangir) he could only finish the first floor of his tomb. After his untimely death, Salim sat on the throne according to his father’s wish and took the title Nuruddin Muhammad Jahangir. His first architectural achievement was his father Akbar’s tomb. If we study the design of the present Akbar tomb, one can easily find that it was probably not built with the known Akbari architectural style. Unfortunately his son Jahangir could not actualize his father’s vision in his cherished tomb. 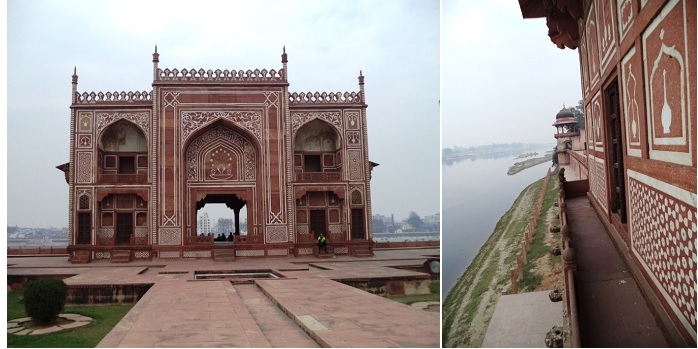 Ten years later after the commissioning of Akbar’s tomb at Sikandra, Jahangir’s wife and empress Noor Jahan realized her father-in-law’s vision when she decided to build her own parents’ mausoleum (The tomb of Itimad-ud-Daulah) on the eastern banks of the river Yamuna. Readers might easily ask why we are discussing Akbar and his architectural style while talking about the tomb of Itimad-ud-Daula? This issue will be clarified as we proceed. Empress Noor Jahan was highly talented and educated as a lady of her time. She was a poet and a skilful artist. She reflected her father-in law Akbar’s vision in planning and designing the tomb of Itimad-ud-Daula. 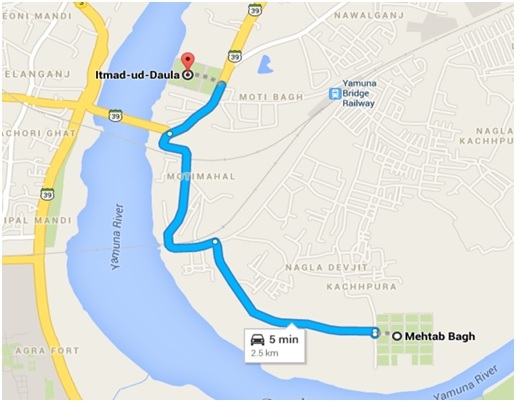 Unlike other Islamic tombs, the peculiar east way directed entrance of Itimad-ud-Daula tomb might have been due to its position on the eastern banks of the river Yamuna. The tomb had won its “Jewel box” name for its close resemblance with the design and layout of a jewellery box. 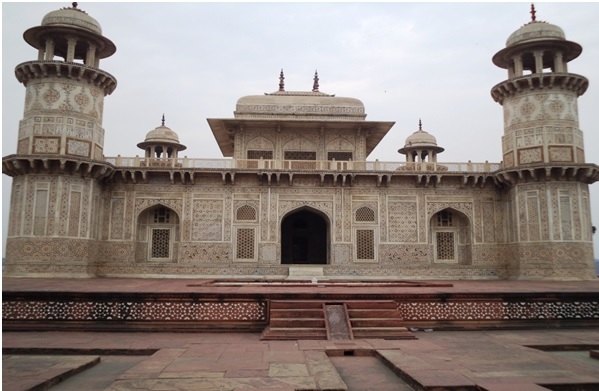 The mausoleum of Itimad-ud-Daulah is unique of its kind particularly in its design and architectural hallmarks. 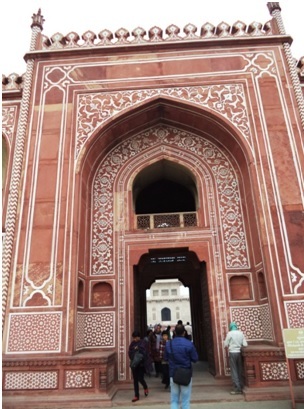 The main gateway of the tomb is built with red sandstone with white marble borders and designs beautifully inscribing the red sandstone base. The use of such amalgamation of red sandstone with white marble borders and designs in Mughal monuments was first introduced by emperor Akbar. In his famous book Ain-e-Akbari, Abul Fazal had indicated that Akbar had built five hundred buildings in the Agra fort using similar architectural features. Abdul Hamid Lahori the writer of ‘Badshahnama and the court chronicler of Shah Jahan, also mentioned the use of this uniquely amalgamated design in Mughal monuments. The mausoleum covers about 23 meters square area. It is built on a base or platform about 50 meters square and about 1 meter high. The centrally located mausoleum building is built with milky white marble. It is set amidst the typical “Charbagh” garden pattern introduced by emperor Babur. The garden is criss-crossed by water channels and walkways leading to the main tomb. Itimad-ud-Daula is a gem of architectural splendour which flourished in the Mughal India. Its designers successfully combined Persian (example: use of chhatris in the minarets) as well as Indian art (rectangular designs on walls) for designing the layout of this wonderful monument. The mausoleum consists of four strong bastions/pillars (located in the four corners) which have continued as four hexagonal towers or minarets (thirteen meters tall). If we carefully look at the mausoleum these four minarets are comparatively smaller than the overall height of the tomb. The apexes of the minarets are covered with bracketed/ornamented structures commonly known as “Chhatri” (umbrella like structures). The use of similar Chhatris is also seen in Akbar’s tomb, Sikandra; Khan-i-Khanan Abdur Rahim Khan’s tomb, New Delhi and Humayun’s tomb, New Delhi. It could be that, the designers of the Taj Mahal might have taken the idea of minarets from the ‘Baby Taj’ Itimad-ud-Daulah. Structurally there are clear cut differences in the orientation of the minarets used in the Taj Mahal and Itimad-ud-Daulah. The minarets of the Taj Mahal are constructed separately from the main mausoleum and located on corners of the central platform. 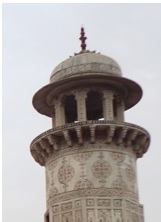 In case of the Itimad-ud-Daula, the minarets are built from the structure of the mausoleum itself. 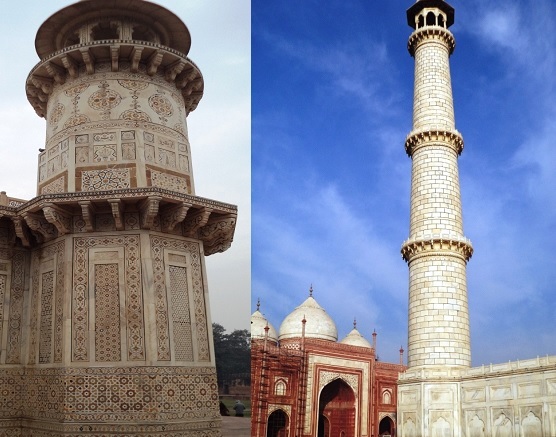 Further the Taj Mahal minarets are much taller as compared to those in the tomb of Itimad-ud-Daulah. Instead of the common onion shaped Persian style domes (used in Humayun’s tomb and the Taj Mahal), the top of Itimad-ud-Daulah’s tomb contains a rectangular dome. This rectangular dome is very similar to that used in Akbar’s tomb at Sikandra and those used in many of the palace buildings at the Fatehpur Sikri city complex. Pietra Dura is one of the greatest architectural innovations made by the mighty Mughals, probably the origin of which could be credited to Emperor Akbar. As discussed earlier, Emperor Akbar had thought of introducing Pietra Dura techniques for designing his own Makbara which unfortunately could not happen due to his untimely death. 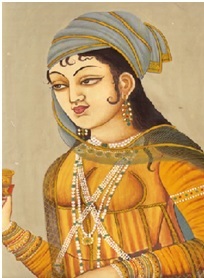 But the technique was successfully implemented by empress Noor Jahan in her father Itimad-ud-Daulah’s tomb. Pietra Dura is a technique by which various beautification and artistic designs in the forms of vases, flowers, collage etc are created by placing and inscribing semi-precious and precious stones like coral, pearl, cornelian, jasper, lapis lazuli, onyx, topaz etc on white marble base. 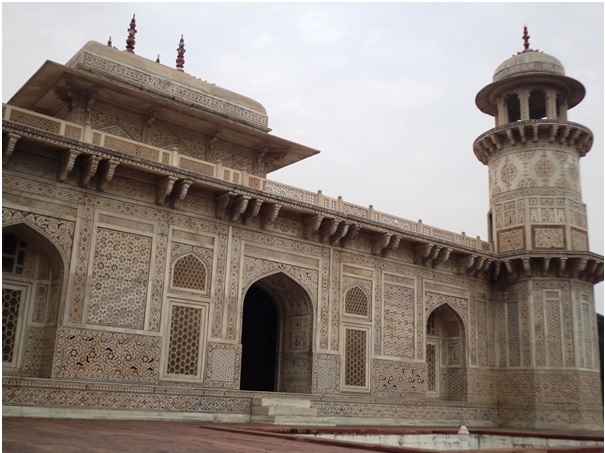 The technique was already in place during Akbar’s reign because the emperor had first emphasized on using white marble borders and designs on red sandstone bases. The outer walls of the Itimad-ud-Daulah are ornamented with Pietra Dura mosaic designs. 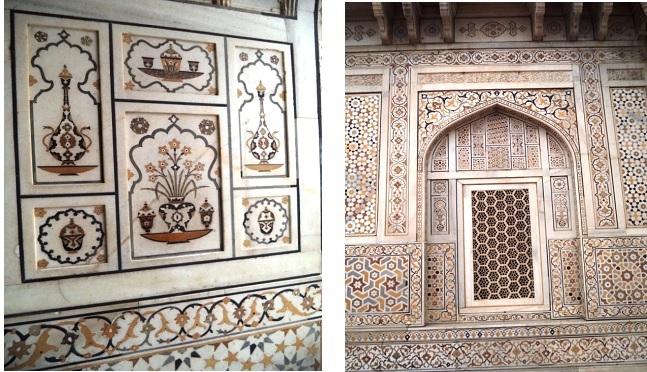 The difference of Pietra Dura in Itimad-ud-Daula and that in Taj Mahal lies in the predominance of the use of more abstract and mosaic designs in the former. 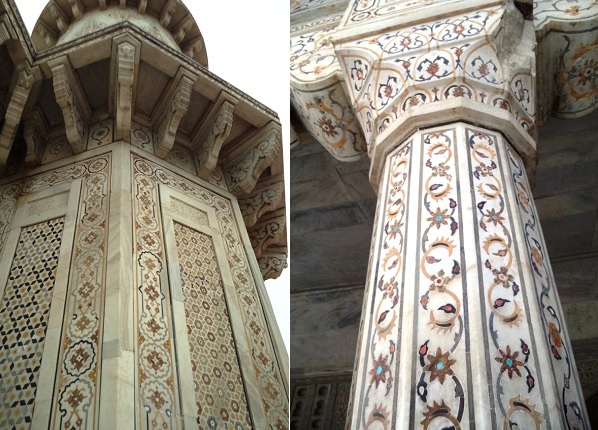 Pietra Dura used in the Taj Mahal and other Shah Jahani monuments & buildings emphasizes more on the grandeur of white marble itself. Pietra Dura designs used here are simple, yet more majestic in appeal by enhancing the glamour of white marble base by showcasing simple plant-like designs instead of complex abstract and mosaic forms. 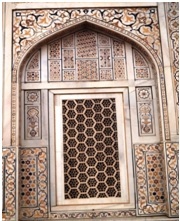 The mausoleum also features the use of “Jaalika” or marble screens in its windows. This unique architecture was introduced by emperor Akbar in the Dargah of Salim Chisti located at Fatehpur Sikri. 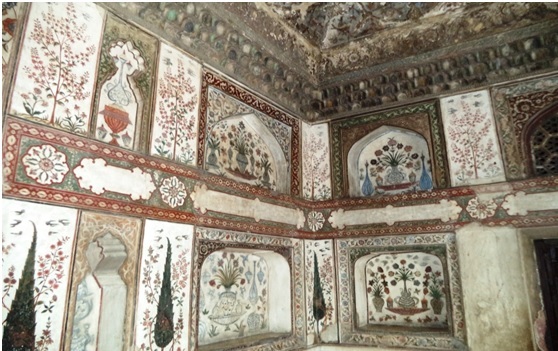 The ceiling and inner wall of the tomb of Itimad-ud-Daulah is decorated with graceful coloured murals. These murals include beautiful paintings of flower vases, wine glasses, wine jars, fruit bowls, flowers, plants, cypresses, etc decorating the stones walls. The holy speech of the Quran Sharif is inscribed in between the murals. The Itimad-ud-Daulah tomb complex also features the famous Manzil Mahal built by emperor Jahangir. This two storied mansion bears structural resemblance with the main gate of Itimad-ud-Daulah and is located on the banks of the river Yamuna. It is believed that this mansion was probably used by the emperor and the empress as a guest house during their visits to the tomb. The mansion displays the Akbari architectural style in terms of using red sandstone walls having white marble borders and decorations. The building contains beautiful verandahs located on either sides facing the Yamuna and the tomb. The Manzil Mahal presents a spectacular view of the Yamuna and is a lovable hangout place for tourists visiting the tomb of Itimad-ud-Daulah. There is a controversy around the tomb of Itimad-ud-Daulah. It is quite often debated whether, Ladli Begum, the daughter of empress Noor Jahan (Ladli Begum was later married to Shahryar, the youngest son of Jahangir), was rested for peace in her maternal grandparents’ tomb. Some scholars debate that she was buried along with her mother Noor Jahan at her tomb in Lahore. We spent some adorable moments on the Yamuna side terrace of Manzil Mahal. Although it was getting very cold we were enjoying the scenic beauty of the serpentine Yamuna in front of us. Many of the visitors were having fun by feeding the monkeys that flocked in and around the manzil Mahal. We had a good look at our snaps on the camera LED monitor. 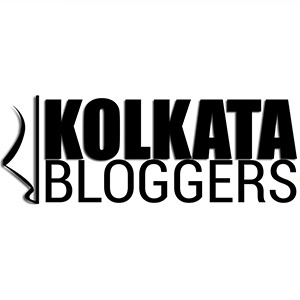 Initially we were quite apprehensive that with the gloom around us, whether we would be able to have clear shots of the wonderful peitra dura and carved murals on the walls of Itimad-ud-daulah. In end we were happy to have all our shots in excellent shape. Before we left the Itimad-ud-daula complex, we had a peek into the ASI sales counter near the gate. It had a collection of numerous catalogues, research books on archaeology, picture albums of various heritage sites in and around India. We were overjoyed to have a glimpse of some rare collection of books and reading materials on the Mughal glory. 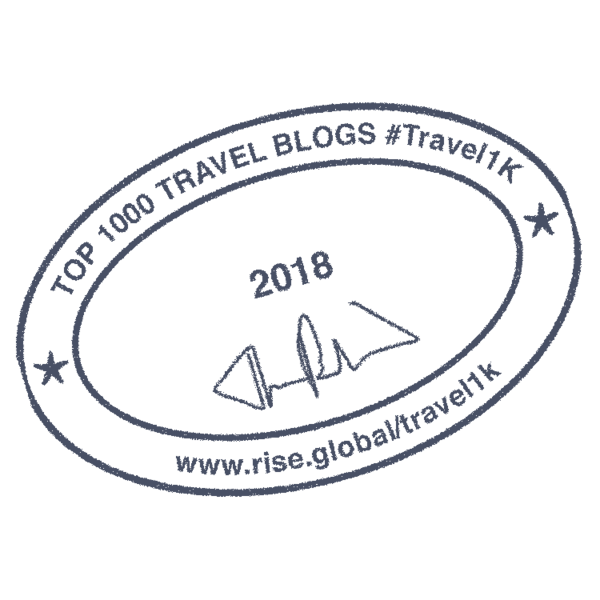 As we had very little time ahead, and with a slight improvement in the weather, we decided to move out for our next destination Chini Ka Rauza located very near to the Itimad-ud-Daulah. 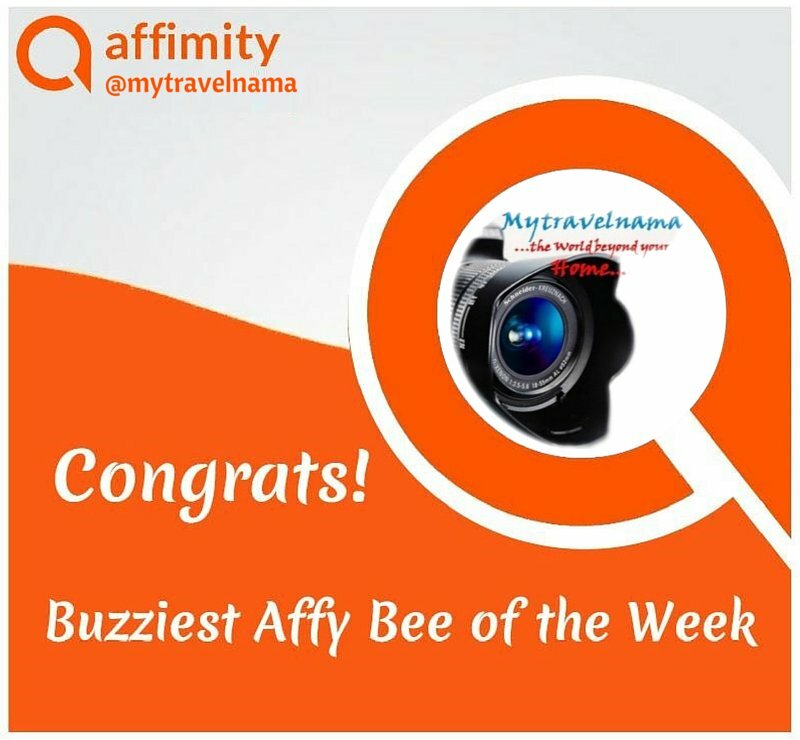 Such beautiful architectures we get to see when we visit these places…thanks for sharing.